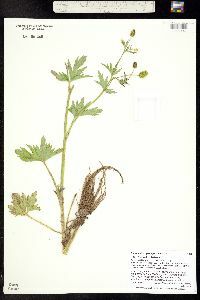 Stems erect, never rooting nodally, hispid, base not bulbous. Roots never tuberous. Basal leaf blades broadly cordate in outline, 3-foliolate, 1.6-7 × 3-9 cm, leaflets cleft, usually deeply so, ultimate segments narrowly elliptic, margins toothed, apex acute. Flowers: receptacle hirsute; sepals reflexed ca. 1 mm above base, 3-5 × 1.5-2 mm, ± hispid; petals 5, yellow, 2-4 × 1-2.5 mm. Heads of achenes cylindric, 9-12 × 5-7 mm; achenes 1.8-2.8 × 1.6-2 mm, glabrous, margin forming narrow rib 0.1-0.2 mm wide; beak persistent, broadly lanceolate or nearly deltate, straight or nearly so, 0.6-0.8 mm. 2 n = 16. Flowering late spring-summer (Jun-Aug). Stream banks, bogs, moist clearings, depressions in woodlands; 0-1700 m; Alta., B.C., Man., N.B., Nfld., N.W.T., N.S., Ont., P.E.I., Que., Sask. ; Alaska, Ariz., Colo., Conn., Del., D.C., Idaho, Ill., Ind., Iowa, Maine, Md., Mass., Mich., Minn., Mont., Nebr., N.H., N.J., N.Mex., N.Y., N.Dak., Ohio, Pa., R.I., S.Dak., Vt., Wash., W.Va., Wis., Wyo. 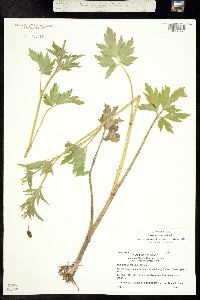 Ojibwa tribes used Ranunculus pensylvanicus as a hunting medicine; the Potawatomi used it as an astringent for miscellaneous diseases (D. E. Moerman 1986). Infrequent in wet places about lakes and in marshes and rarely in ditches in the lake area. 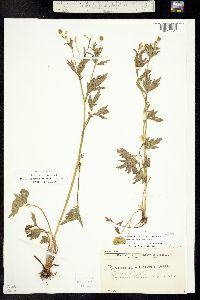 Coulter reported it in his Catalogue for McDougal from Putnam County, but there is no specimen in the herbarium of DePauw University where McDougall's Indiana specimens are deposited. Spreading-hairy annual or perennial, erect, simple or branched, 3-7 dm; basal lvs soon withering, cauline few, petioled; lf-segments 3, the terminal one stalked, all deeply 3-lobed, the lobes toothed or incised; fls few, short-pedicellate; pet obovate, 2-4 mm, shorter than the reflexed sep; anthers 0.7-1 mm; achenes in a cylindric or ovoid-cylindric head mostly 10-15 mm, subrotund, 1.8-2.7 mm, sharply margined; beak flat-subulate, 0.6-1.4 mm, straight or curved; 2n=16. Marshes, ditchbanks, and wet meadows; Nf. to Alas. and e. Asia, s. to N.J., Pa., O., n. Ind., n. Ill., Minn., and Ariz. July, Aug.